It was Oct. 1 last year when Flint residents were told to stop drinking the city’s water, after the state belatedly confirmed it was poisoned by lead leaching from pipes into the water supply. News reports and government directives rolled out over the weeks and months that followed. 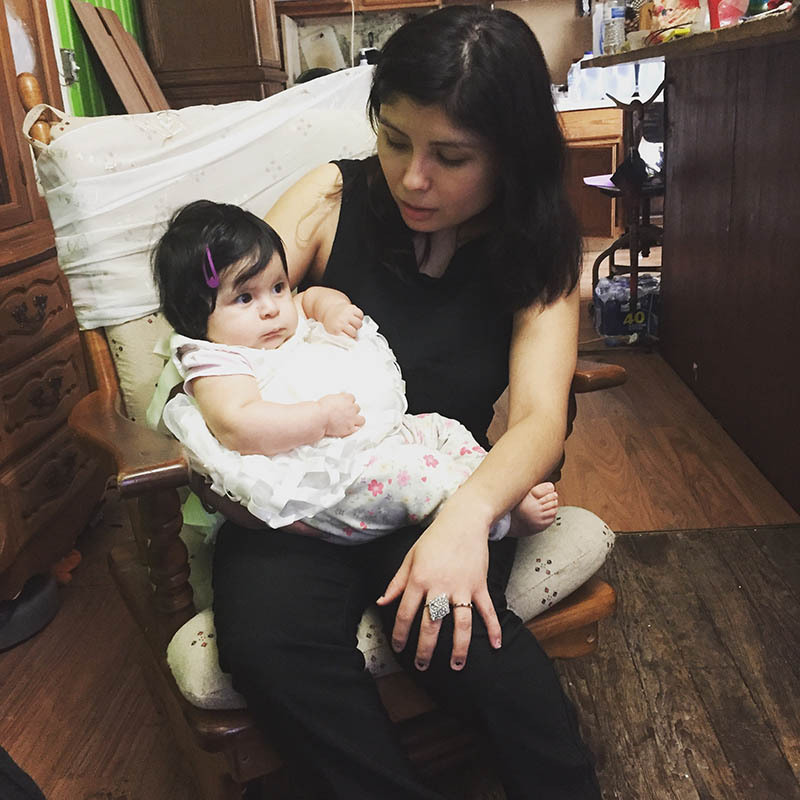 But for a variety of reasons, Vargas and her father, Sergio, said they did not become aware of the threat until January, only a few weeks before Yaquelin Vargas’s infant daughter, Lydia, would be diagnosed with lead poisoning. Stories like Vargas’s are not uncommon among Flint’s Latino immigrant community of roughly 4,000, a group that includes nearly 1,000 undocumented residents. In a city where delayed revelations about lead-poisoned water ignited international outrage, perhaps no corner of Flint learned of the threat posed by lead later than its Spanish-speaking residents. In Flint, National Guard members distributed Spanish-language flyers door-to-door after the lead crisis broke publicly. But some wary residents, on edge from stepped up federal deportation raids, either didn’t read them or didn’t trust the information provided. More alarming, community activists say, were inaccurate early announcements that Flint residents would need to show photo identification to receive free water bottles. There were also confusing, inaccurate rumors about why the water tasted bad. The dearth of local Spanish-language media didn’t help. They knew E.coli bacteria had been found in their tap water, and they were told to boil it. She said they were then told they could drink the water if they used a filter. But throughout Yaquelin Vargas’s pregnancy — and after Lydia’s birth, on Sept. 12, as the infant breastfed — mother and grandfather said they never caught wind of lead in the water. It was not until early January, when Lydia was not tracking the movements of her mother’s finger, that Yaquelin Vargas said she suspected something was wrong. It was not until late January, when a volunteer from nearby St. Mary’s Catholic Church knocked on their door, that the Vargas family said they were first told to completely abstain from using tap water. January turned out to be a busy month for community outreach in Flint. On Jan. 5, Gov. Rick Snyder finally declared a state of emergency in Flint, as the city’s story splashed across front pages worldwide. Six days later, the Michigan Department of Technology, Management and Budget printed 15,000 handbills in Spanish with relevant information about the water crisis, according to state public information officer Ron Leix. David Kaiser, a spokesperson for the Michigan State Police, told Yahoo News the following day that photo ID “is not required, it’s just requested” and that residents’ addresses were only being tracked to ensure that free water, filters and supplies were actually going to residents of Flint and to get a better handle on where help was most needed in the community. But some didn’t get the message. At Fire Station no. 1 — one of fire stations turned into water distribution centers — a National Guardsman required photo ID before handing over a case of bottled water to each car that lined up. “During a disaster is not the time to think about someone’s immigration status,” Leix told Bridge. “We heard rumors on social media that (the ID request) was being used as an opportunity to find undocumented workers. But we tried to debunk that. We sent out a press release immediately. Still, it was a concern. “I’m not here legally. And I’m always scared that they’ll arrest me, and then deport me,” a single mother, identified only as Lucia, told Zarowny. At Our Lady of Guadalupe in northern Flint, parish member and attorney Victoria Arteaga told Bridge she encountered “a few dozen families who came to us and said they didn’t know” of the water crisis. Most of the written information about the water crisis that had reached the church was only written in English, “so we translated it ourselves,” she said. That weekend, January 23-24, community volunteers, alarmed by the television report, set out to knock on doors and spread the word among Spanish-speaking residents about the danger of drinking the water. Cross, the radio host, said that’s how a Spanish-speaking volunteer from St. Mary’s Church met Yaquelin Vargas. Juani Olivares, who chairs the Genesee County Hispanic/Latino Collaborative, an advocacy group, estimated that 95 percent of the people that volunteers encountered that weekend were unaware lead had contaminated Flint’s water supply or that the lead-poisoned water posed a health risk, particularly to children. “We realized we needed to do something because the problem (of people not knowing) was bigger than we were told,” Olivares said. The impact was immediate. Deacon Paul Donnelly, of St. Mary’s Catholic Church, was interviewed by reporter Natalie Zarowny and used his Channel 12 airtime to tell viewers they could get water from the church without identification. Bookkeeper and secretary Kathy Tomczyk said she witnessed “an explosion” of people on Thursday morning who needed cases of water to drink and bathe themselves. Truckloads of donated water pallets have arrived at St. Mary’s from all across the country, including Rhode Island, Virginia and Kansas. And still, it’s not enough. St. Mary’s gave out 1,054 cases of water one week in early May, said Tomczyk. She said she expects those numbers to increase now that three fire stations are no longer distributing water. How could the city and state have done a better job of reaching out to Flint’s undocumented community at the height of the water crisis? Advocates say that those responding to the lead crisis in Flint can learn lessons from elsewhere in the country. Henry Fernandez, a senior fellow at the Center for American Progress, a progressive public policy research and advocacy organization, lauded how New York City Mayor Michael Bloomberg’s administration reached out quickly to that city’s undocumented immigrant community when Hurricane Sandy hit in 2012. Even before the hurricane reached the city, the government released an online guide in Spanish and other languages answering questions about disaster assistance. The first question: “Am I eligible for any disaster assistance if I am undocumented?” Yes, the guide answered, and listed specific city, state and federal services available to them. A law that guarantees government officials won’t ask for photo ID during a crisis would also help, said Ryan Bates, executive director of Michigan United, a nonprofit activist group. California has such a law, and Bates said he hopes to convince lawmakers to introduce such a bill in Michigan. When President Obama introduced his 2012 Deferred Action for Childhood Arrivals (DACA) legislation commonly known as the “Dreamers Act,” Los Angeles public schools sent home letters with each Latino immigrant student explaining how family members could apply. Susan Reed, the immigration lawyer, said now that lead poisoning is being documented, it’s imperative for Michigan to expand Medicaid eligibility to include not just children who are U.S. citizens but all Flint children, including the undocumented or those holding Green Cards. Under current law, a noncitizen must have a Green Card for five years to be eligible for Medicaid. But Anna Heaton, the governor’s press secretary, responded that it’s federal law that prevents undocumented immigrants from enrolling in Medicaid. “This population most often seeks health care from free clinics and federally qualified community health centers, of which there are several in Flint,” she said. Nice work on this Jacob. If you're going to come into the U.S. illegally, and not listen to the news or read a newspaper, there are consequences. I don't wish for anyone to be sick, but you have to be informed! So you're Native American? Or you just illegally entered America a few generations back so that's OK? Did you account for the fact that many people entered the country as legal immigrants? Fair enough. Now, are the only two ways to be a U.S. citizen Native American heritage and illegal entry? Until the late 1970's or even early 1980's, lead was everywhere. In the gasoline, in the water systems, in paint, in the airborne dust, and probably a lot in our bodies. We grew up with lead, mercury, and asbestos everywhere. We played with little balls of mercury on our school desks. Anyone born before then probably has lots of bad stuff in our bodies, but we continue to be successful in life and the average lifespan continues to get longer. There are lots of US cities which, if measured to the extent Flint has been, would have lead levels in the water somewhere in the city similar to that in Flint. Every house built before 1986 has lead in the internal plumbing. If any non-citizen doesn't like the living conditions here, well, we all have two feet. The lady at the top of the article had a doctor...is the doctor liable for anything? The Latino community apparently learned real fast about ID requirements...so why not the water issues? Seems like if you're going to live under the radar you have to accept some responsibility. This article identifies a significant amount of effort, both public and private, to get the message out to everyone...(and if households don't have a radio or TV, I doubt they have Internet to access Mr Bloomberg's website.). I don't wish people harm, but government is not our protector for everything that happens in our lives. PS, I wish Bridge would research Rich's comments about all the bad stuff we grew up with as kids, and why the assumed dire effects haven't seemed to hinder our adult lives that much. The problem always seems to be that the "disaster response plan" is developed by government officials who are not members of those groups of people who will need the most assistance; people who cannot afford Internet or television or have language barriers. Up front, any disaster response plan needs to incorporate representatives of those people whether from the schools, the churches or nonprofit organizations. And that requires identifying and maintaining contact with key groups long before a disaster occurs. If government employees continue to operate under the assumption that they have all the answers, they will continue to fail the most in need. I know that each Michigan county and many State agencies are required to develop an Emergency Management Plan. And I assume the cities have those as well. Do those plans address this issue? They should. Was any Emergency Management Plan followed for the Flint disaster? Play stupid games, win stupid prizes. There are many risks inherent in flagrantly violating the laws of another nation for your own selfish reasons. One of them, if you haven't bothered to learn the language of the country you are trespassing into, is that you will miss out on something that's in the language of that country. It's a tragedy that young children of any sort were harmed by this. Clearly America has serious problems taking care of our own dilapidated cities and poor citizens. We do not have the bandwidth to take care of 10% of Latin American poor on top of that. We should run ads in Mexico and Central America telling the terrible story of the poor Mexicans who now have brain-damaged children as a result of foolishly and selfishly sneaking into American illegally, to help deter future miscreants and as a humanitarian warning. For people in the country illegally, how about a bus ride to their own country. The Flint Immigrant Community gets the same as everybody else. Stop this non-sense in segregation. Poor Flint People, White Flint People, Black Flint People, Immigrant Flint People, Gay Flint People, Working Flint People, Living on the Government Flint People, etc. Shame all those folks with the snide, disparaging, uncaring, callous comments about immigrants, illegal or legal. They are human beings and irrespective of how they got here they do not deserve to be poisoned or harmed because of our government's incompetence and should be taken care of. I can't believe you treat treat people different.